Ceremonial unveiling of new homeland security drone at General Atomics. The Pentagon, military, intelligence agencies and military contractors are longtime proponents of UAVs for intelligence, surveillance and reconnaissance (ISR) missions. Following President Bush’s declaration of a “global war on terrorism,” the White House became directly involved in expanding drone deployment in foreign wars – especially in directing drone strikes. The most unabashed advocates of drone proliferation, however, are in Congress. They claim drones can solve many of America’s most pressing problems – from eliminating terrorists to keeping the homeland safe from unwanted immigrants. However, there has been little congressional oversight of drone deployments, both at home and abroad. Drone promotion by U.S. representatives and senators in Congress pops up in what at first may seem the unlikeliest of places. Annually, House members join with UAS manufacturers to fill the foyer and front rooms of the Rayburn House Office Building with displays of the latest drones – an industry show introduced in glowing speeches by highly influential House leaders, notably Buck McKeon, the Southern California Republican who chairs the House Armed Service Committee and co-chairs the Congressional Unmanned Systems Caucus (CUSC). Advances in communications, aviation and surveillance technology have all accelerated the coming of UAVs to the home front. Yet drones aren’t solely about technological advances. Money flows and political influence also factor in. At the forefront of the money/politics nexus is the Congressional Caucus on Unmanned Systems (CCUS). Four years ago, the CCUS (then known as the House Unmanned Aerial Vehicle Caucus) was formed by a small group of congressional representatives – mainly Republicans and mostly hailing from districts with drone industries or bases. By late 2012, the House caucus had 60 members and had changed its name to encompass all unmanned systems – whether aerial, marine or ground-based. This bipartisan caucus, together with its allies in the drone industry, has been promoting UAV use at home and abroad through drone fairs on Capitol Hill, new legislation and drone-favored budgets. In late 2012, the caucus comprised a collection of border hawks, immigration hardliners and leading congressional voices for the military contracting industry. 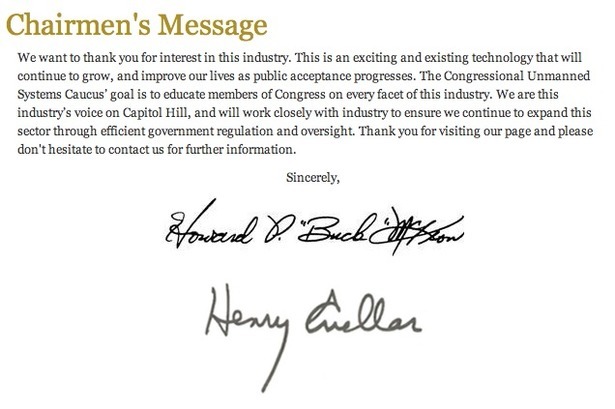 The two caucus co-chairs, Howard “Buck” McKeon, R-California, and Henry Cuellar, D-Texas, are well positioned to accelerate drone proliferation. 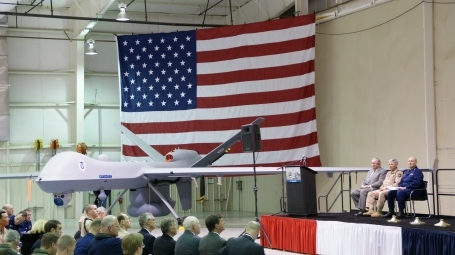 McKeon, whose southern California district includes major drone production facilities, notably General Atomics, is the caucus founder and chair of the House Armed Services Committee. Cuellar, who represents the Texas border district of Laredo, is the ranking member (and former chairman) of the House Subcommittee on Border and Maritime Security. Other caucus members include Brian Bilbray (R-Calif.), who heads the House Immigration Reform Caucus; Candice Miller (R-Minn.), who heads the Homeland Security subcommittee that reviews the air and marine operations of DHS; Joe Wilson (R-SC); Jerry Lewis (R-Calif.); Dana Rohrabacher (R-Calif.); Loretta Sanchez (D-Calif.); and Duncan Hunter (R-Calif.). Eight caucus members were also members of the powerful House Appropriations Committee in the 112th Congress. The caucus and its leading members (along with drone proponents in the Senate) have played key roles in drone proliferation at home and abroad through channeling earmarks to Predator manufacturer General Atomics, prodding the Department of Homeland Security to establish a major drone program, adding amendments to authorization bills for the Federal Aviation Administration and Department of Defense to ensure the more rapid integration of UAVs into the national airspace, and increasing annual DOD and DHS budgets for drone R&D and procurements. To accelerate drone acquisitions and deployment at home, Congress has an illustrative track record of legislative measures (see accompanying box). CCUS cosponsors the annual drone fete with the Association of Unmanned Vehicle Systems International (AUVSI), an industry group that brings together the leading drone manufacturers and universities with UAV research projects. AUVSI represents the interests in the expansion of unmanned systems expressed by many of the estimated 100 U.S. companies and academic institutions involved in developing and deploying the some 300 of the currently existing UAV models. The drone association has a $7.5-million annual operating budget, including $2 million a year for conferences and trade shows to encourage government agencies and companies to use unmanned aircraft. The close relationship between the congressional drone caucus and AUVSI was reflected in a similar relationship between CBP/OAM and AUVSI. Tom Faller, the CBP official who directed the UAV program at OAM, joined the AUVSI 23-member board-of-directors in August 2011, a month before the association hosted a technology fair in foyer of the Rayburn House Office Building. OAM participated in the fair. Faller resigned from the unpaid position on Nov. 23, 2011 after the Los Angeles Times queried DHS about Faller’s unpaid position in the industry association. Faller is currently subject of a DHS internal ethics-violation investigation. While the relationship between increasing drone contracts and the increasing campaign contributions received by drone caucus members can only be speculated, caucus members are favored recipients of contributions by AUVSI members. In the 2010 and 2012 election cycles, political action committees associated with companies that produce drones donated more than $2.4 million to members of the congressional drone caucus. The relationship that has been consolidating between General Atomics and the U.S. Air Force since the early 1990s has been mediated and facilitated in Congress by influential congressional representatives, led by southern Californian Republican Rep. Jerry Lewis, a member of the House Appropriations Defense Committee and vice-chairman of the House Permanent Select Committee on Intelligence. Lewis, a favored recipient of General Atomics campaign contributions, used his appropriations influence to ensure that the Air Force gained full control of the UAV program by 1998. Lewis, a prominent member of the “Drone Caucus,” has received at least $10,000 every two years in campaign contributions from General Atomics’ political action committee – $80,000 since 1998, according to OpenSecrets.org. During the 2012 campaign cycle, General Atomics was the congressman’s top campaign donor. Senator Feinstein has been a highly consistent supporter of the intelligence community and military budgets. Her failure to oppose the clandestine drone strikes ordered by the White House and CIA have sparked widespread criticism by those who argue the strikes are unconstitutional, illegal under international law and counterproductive as a counterterrorism tactic. In 2012, General Atomics was Feinstein’s third largest campaign contributor, while other leading contributors were the military contractors General Dynamics (from which General Atomics emerged), BAE Systems and Northrup Grumman. Feinstein’s connections to General Atomics extend beyond being top recipient of their campaign contributions. Rachel Miller, a former (2003-2007) legislative assistant for Feinstein, has served as a paid lobbyist for General Atomics, both working directly for the firm (in 2011) and as a General Atomics lobbyist employed by Capitol Solutions (2009 – present), one of the leading lobbying firms contracted by General Atomics. And did you know that Linden Blue plans to marry Retired Rear Adm. Ronne Froman? Few others knew about the engagement of this high-society San Diego couple until Senator Feinstein announced the planned marriage at a mid-November 2012 meeting of the downtown San Diego business community – news that quickly appeared the Society pages of the San Diego Union-Tribune. There has been no explanation offered why Feinstein broke this high-society news, but the announcement certainly did point to the senator’s likely personal connections to Blue and Froman (who was hired by General Atomics as senior vice-president in December 2007 and has since left the firm). Campaign contributions and personal connections create goodwill and facilitate contracts. General Atomics also counts on the results produced by a steady stream of lobbying dollars – which have risen dramatically since 2003, and been averaging $2.5 million annually since 2005. In 2012, General Atomics spent $2,470,000 lobbying Congress. Tens of millions of dollars in congressional earmarks in the 1990s went to General Atomics and other military contractors for the early development of what became the Predator program, reported the New York Times. Inouye was a source of a number of these multimillion earmarks for General Atomics, whose large campaign contributions to the influential Hawaii senator from 1998 to 2012 ($5000 in this last campaign) could be regarded as thank-you notes since Inouye faced insignificant political opposition. Besides campaign contributions, General Atomics routinely hands out favors to congressional representatives thought likely to support drone proliferation. A 2006 report by the Center for Public Integrity identified Jerry Lewis as one of two congressional members and more than five dozen congressional staffers who traveled overseas courtesy of General Atomics. The center’s report, The ‘Top Gun’ of Travel, observed this “little-known California defense contractor [has] far outspent its industry competitors on travel for more than five years — and in 2005 landed promises of billions of dollars in federal business.” Most of this business was in the form of drone development and procurement by the Pentagon and DHS. In practice, there’s more boosterism than effective oversight in the House Homeland Security Committee and its Subcommittee on Border and Maritime Security, which oversees DHS’s rush to deploy drones to keep the homeland secure. The same holds true for most of the more than one hundred other congressional committees that purportedly oversee the DHS and its budget. Since DHS’ creation, Congress has routinely approved annual and supplementary budgets for border security that have been higher than those requested by the president and DHS. CCUS member and chair of the House Border and Maritime Security subcommittee, Representative Candice Miller, R-Michigan, is effusive and unconditional in her support of drones. Miller described her personal conviction that drones are the answer to border insecurity at the July 15, 2010 subcommittee hearing on UAVs. The uncritical drone boosterism in Congress was underscored in aWashington Post article on the use of drones for border security. In his trips to testify on Capitol Hill, Kostelnik said he had never been challenged in Congress about the appropriate use of homeland security drones. “Instead, the question is: ‘Why can’t we have more of them in my district?’” remarked the OAM chief. Since 2004, the DHS’ UAV program has drawn mounting concern and criticism from the government’s own oversight and research agencies, including the Congressional Research Service, the Government Accountability Office and the DHS’s own Office of Inspector General. These government entities have repeatedly raised questions about the cost-efficiency, strategic focus and performance of the homeland security drones. Yet, rather than subjecting DHS officials to sharp questioning, the congressional committees overseeing homeland security and border security operations have, for the most part, readily and often enthusiastically accepted the validity of undocumented assertions by testifying CBP officials. The House Subcommittee on Border and Maritime Security has been especially notorious for its lack of critical oversight. As part of the budgetary and oversight process, the House and Senate committees that oversee DHS have not insisted that CBP undertake cost-benefit evaluations, institute performance measures, implement comparative evaluations of its high-tech border security initiatives, or document how its UAV program responds to realistic threat assessments. Instead of providing proper oversight and ensuring that CBP/OAM’s drone program is accountable and transparent, congressional members from both parties seem more intent on boosting drone purchases and drone deployment. As CBP was about to begin its first drone deployments in 2005 as part of the Operation Safeguard pilot project, the Congressional Research Service observed: “Congress will likely conduct oversight of Operation Safeguard before considering wider implementation of this technology.” Unfortunately, Congress never reviewed the results of Operation Safeguard pilot project, and CBP declined requests by this writer to release the report of this UAV pilot project. Congress has been delinquent in its oversight duties. In addition to the governmental research and monitoring institutions, it has been mainly the nongovernmental sector – including the American Civil Liberties Union, Electronic Frontier Foundation, Center for Constitutional Rights, and the Center for International Policy – that has alerted the public about the lack of transparency and accountability in the DHS drone program and the absence of responsible governance over the domestic and international proliferation of UAVs. In September 2012, the Senate formed its own bipartisan drone caucus, the Senate Unmanned Aerial Systems Caucus, co-chaired by Jim Inhofe (R-Okla.) and Joe Manchin (D-W.Va.). “This caucus will help develop and direct responsible policy to best serve the interests of U.S. national defense and emergency response, and work to address any concerns from senators, staff and their constituents,” said Inhofe. It is still too early to ascertain if the Senate’s drone caucus will follow its counterpart in the House in almost exclusively focusing on promoting drone proliferation at home and abroad. It is expected, however, that caucus members will experience increased flows of campaign contributions from the UAS industry. While Senator Manchin just won his first full-term in the 2012 election, Senator Inhofe has been favored by campaign contributions from military contractors, including General Atomics ($14,000 in 2012), since he took office in 2007. His top campaign contributor was Koch Industries. For its part, AUVSI, the drone industry association, gushed in its quickly offered commendation. “I would like to commend Senators Inhofe and Manchin for their leadership and commitment in establishing the caucus, which will enable AUVSI to work with the Senate and stakeholders on the important issues that face the unmanned systems community as the expanded use of the technology transitions to the civil and commercial markets,” said AUVSI President and CEO Michael Toscano. “It is our hope to establish the same open dialogue with the Senate caucus as we have for the past three years with the House Unmanned Systems Caucus,” the AUVSI executive added. There is rising citizen concern about drones and privacy and civil rights violations. The prospective opening of national airspace to UAVs has sparked a surge of concern among many communities and states – eleven of which are considering legislation in 2013 that would restrict how police and other agencies would deploy drones. But paralleling new concern about the threats posed by drone proliferation is local and state interest in attracting new UAV testing facilities and airbases for the FAA and other federal entities. FAA and industry projections about the number of UAVs (15,000 by 2020, 30,000 by 2030) that may be using national airspace – the same space used by all commercial and private aircraft – have sparked a surge of new congressional activism, with several new bills introduced by non-drone caucus members in the new Congress that respond to the new fears about drone proliferation. Yet there is no one committee in the House or the Senate that has assumed the responsibility for UAV oversight to lead the way toward creating a foundation of laws and regulations establishing a political framework for UAV use going forward. Tom Barry directs the TransBorder Project at the Center for International Policy and is the author of Border Wars from MIT Press and numerous books on U.S.-Latin American relations. He is also the author of a new policy report Drones Over the Homeland.